I see, now is the time for me to practice my patience. May I ask what is Yuri? I don't believe I have come across that before. Lovely, hopefully this set can cover a full English ISO board? I felt like Carbon Round 1 had some of the best ISO support I have ever seen on a SA set. I'd definitely consider buying into this new set too if I can fully populate my ISO UK boards. After that I'll be twiddling my thumbs until Carbon Round 2! As i said GB starts somewhere in July on Massdrop. - Rich colorway variety for a gmk keyset. For example, you can eliminate orange keys completely (say only beige and gray keys). - Code keys instead of windows. I like it more os neutral and i hope you agree with me. Just add international shipping, customs, and if you're in Britain: downright daylight robbery to calculate your final price! It's the fun game for everyone in Europe: see whose guess is closest to what it costs to reach your door! And whether MassDrop even remembers to file an export form. Whoopee! Muirium wrote: ↑ Just add international shipping, customs, and if you're in Britain: downright daylight robbery to calculate your final price! It's the fun game for everyone in Europe: see whose guess is closest to what it costs to reach your door! And whether MassDrop even remembers to file an export form. Whoopee! I agree, it's not cheap for europeans to buy from MD. I am from Germany so i know the struggle. Just one very little thing I noticed.. How come you've gone with "Sys Req" instead of "Sys Rq". Was that intentional? It looks a little funny to me. Otherwise looking great. I'm still sad about no R5, but I think I will order anyway. photekq wrote: ↑ Just one very little thing I noticed.. How come you've gone with "Sys Req" instead of "Sys Rq". Was that intentional? It looks a little funny to me. Oh my bad. Probably from other gb render. I think GMK will do it in a proper way anyway. 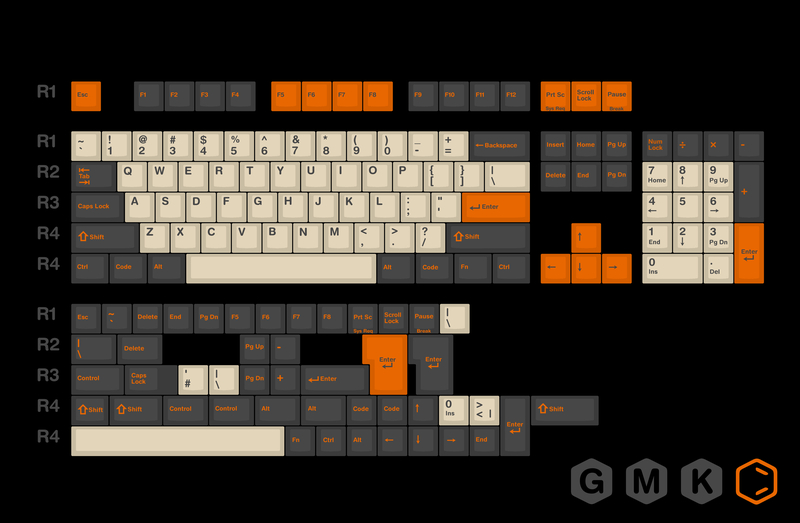 I wish i could make full r5 bottom row, but as you know GMK does not have R5 1.25u keys. So i had to take r5 1.5u mods out, to keep the costs low. The FC660 thanks you for catering to his keycap desires and will definitely add this set to his wardrobe! Is it possible to get a comparison between classic beige alphanumeric colors and these alphanumerics ? Wodan wrote: ↑ Is it possible to get a comparison between classic beige alphanumeric colors and these alphanumerics ? I don't have classic beige but i do have recent enjoypbt keyset, which has offwhite alphas. Keep in mind photos will never display correct colros because of light, camera, monitor etc. But i hope this gives you a little bit insight how that beige looks in person. I'll keep an eye out for these caps, but I must admit I'm slightly less optimistic that it will be held on massdrop. I have nothing against MD except the high European delivery fees. It's alright for high cost items, but when delivery costs 25% of the item or thereabouts - that's just too high. rominronin wrote: ↑ I'll keep an eye out for these caps, but I must admit I'm slightly less optimistic that it will be held on massdrop. I have nothing against MD except the high European delivery fees. I'd like to remind you that the GB is already up and hit its MOQ already. OP has been updated properly. Actually i expected around 250 sold keysets but i am very happy how it goes. I am glad people can buy such set with so many features and custom colors for a price which is below typical GMK prices. Thats something. Now, that the demand on the set is over five hundred, it is very funny to read the posts warning the OP against the set, how low the demand could be considered the recent group buys on skidata+ and Beige sets, LOL. My theory is that Skidata+ just hitting the forums has helped making this set so incredibly successful. Wodan wrote: ↑ My theory is that Skidata+ just hitting the forums has helped making this set so incredibly successful. respect you and no offend to you! !But why say skidata helping this set to be extremely successful? i also respect skidata and its organizer, karura and his team have done great work. Tombery, also have done lots of work to make this happen . Two completely different GB and two seperately great and fabulous GB. Why atrribute the tombery's carbon 's success to skidata? very ridiculous. i always respect you and no offend on you. There were some worries that the similairity of the coloring scheme with Skidata+ might hurt sales of this set. But I've been a fan from the start (scroll up) but completely misjudged the dynamic here. My impression is that while Skidata+ did quite good for itself, it created a great hype about this coloring scheme when it FINALLY arrived and this helped make this set even more successful. Just look at the sales numbers, has there ever been a full GMK set that sold NEARLY as often? Wasn't there then ... how many did they make? Aw too bad I missed that. Well either I missed the bad times of GMK but my experience with their GBs have been very pleasant so far. Seems like they've been stepping up their game for the consumer market. IIRC, there were two major TA issues: LED shine through and crappy MD shipping in keycap trays that weren't made for the job, causing a lot of scratched caps. I think both parties have learned their lesson though; I know Karura has gone through quite some effort to work with GMK to increase the opacity of the caps and I don't think MD will ever ship keycaps in those trays again. Oh meeeh I thought it was a kewwwl tray. Is there an option to add some sandpaper to the tray for another +5$ ? But shine-through doesn't bother me at all. Is the LED shine through problem fixed? I am usually not a big fan of led's on keyboards at all, but when switching on the christmas lights on my GON board, I realized that some of the new RGB mods (think they came from Massdrop sale) have some weird shine through as well. Wodan wrote: ↑ There were some worries that the similairity of the coloring scheme with Skidata+ might hurt sales of this set. I havily doubt SKIDATA+ affected this. I'd like to call myself to be not a colorblind person and if you compare SKIDATA+ and Carbon its day and night difference. The only things they share are the words grey and orange. Compare just real Carbon and SKIDATA+ fotos. Anyway Carbon was done before Skidata+ (do not mix it with og skidata). This sale is influenced by Carbon itself 100%. Thats fact. Just look at Carbon SA request numbers at MD. Carbon SA sold over 700 base sets (and other kits summing upto 2.7k+ sold kits together) and still its very hard to get keyset. It sells in minutes on mechmarket for premium prices. Also it will be hard to find a person who wants to get rid off Carbon. Thats probably the biggest compliment for me if people dont want to sell their Carbon sets. Now i dont want to sound ignorant because its all about my design, so i am very confident you can pull such succesful sale also with Pulse, 1976, Penumbra and etc. Its a fact these sets are very successful and from my pov they can be easily be done as GMK keysets. Demand is here the keyword. And its very high. BimboBB wrote: ↑ Is the LED shine through problem fixed? I am usually not a big fan of led's on keyboards at all, but when switching on the christmas lights on my GON board, I realized that some of the new RGB mods (think they came from Massdrop sale) have some weird shine through as well. No its not fixed to 100%. There are two factors: Plastic and molds. GMK changed its plastic supplier to solve this issue. Since Carbon uses 3 custom colors, i'll receive the samples for new color plastic. I'll test it for color and light bleed and if everything is ok i'll approve it for production. Oh meh I didn't want to turn this into a discussion ... let's just say that Skidata+ hasn't hurt the sales of GMK Carbon. 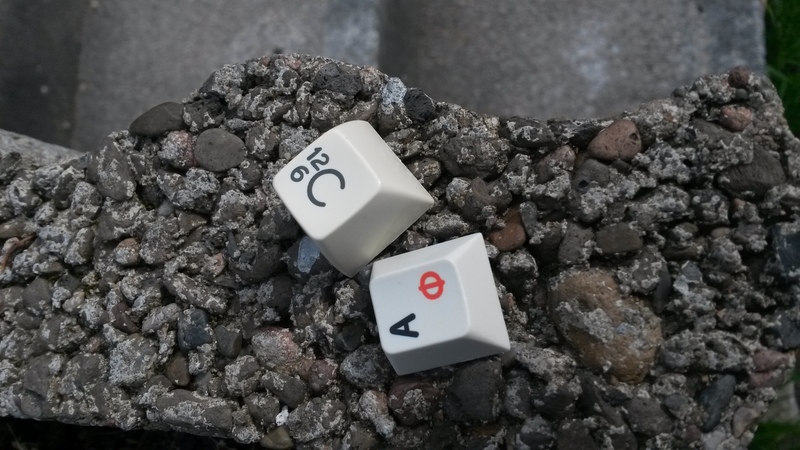 Didn't mean to steal any credit from you for the great success your set is having so far but if you believe such sales/drops happen in complete isolation and aren't affected by other events in the same community, take a look at the brilliant GMK SNES Keycap Set that failed ... 100% because of itself? Regarding the similairity of Skidata modifiers (OG or +) with Carbon modifiers, you kind of put me into a position where I feel like I need to defend myself. You posted GMK renders where GMK actually used the exact same ABS color codes as Skidata! The GMK render on the drop page also doesn't make a night-and-day difference obvious to me. If I am missing essential renders here that make it very obvious how Skidata and Carbon modifiers are very different colors? Well, can't wait to get mine and see the difference for myself!